It’s almost time for the 2017 Virginia F. Cutler Lecture, one of the college‘s most prestigious annual lectures. This year’s speaker is Dr. Laura Padilla-Walker, a School of Family Life professor who studies parenting and media influences during adolescence and emerging adulthood. 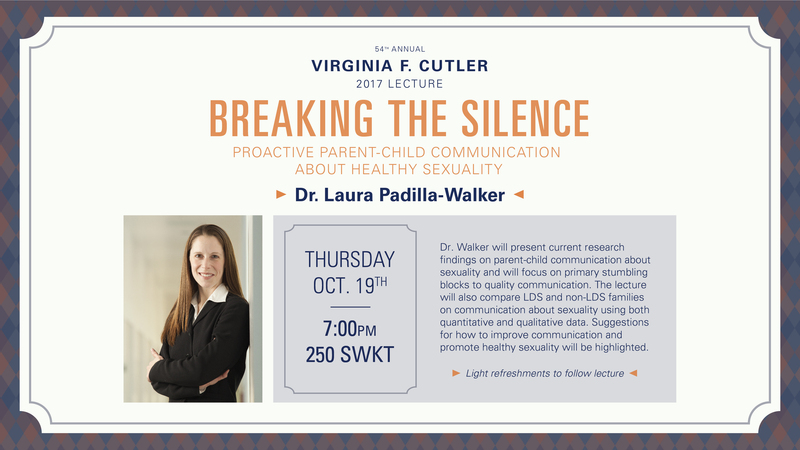 Dr. Padilla-Walker’s lecture is titled “Breaking the Silence: Proactive Parent-Child Communication about Healthy Sexuality.” She will present current research findings on parent-child communication about sexuality and will focus on primary stumbling blocks to quality communication. The lecture will also compare LDS and non-LDS families on communication about sexuality using both quantitative and qualitative data. Suggestions for how to improve communication and promote healthy sexuality will be highlighted. Light refreshments will follow the lecture. The lecture series is named after Virginia F. Cutler, former dean of the College of Family Living (now the College of Family, Home, and Social Sciences). Dr. Cutler cared deeply about women and people in other nations, and her career took her across the globe as she served people in Thailand, Indonesia and Ghana.